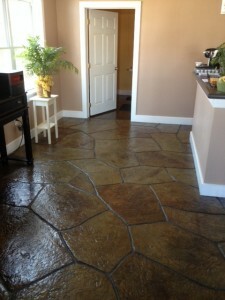 Tatro’s Concrete Impressions is a small, locally owned business in Bennington, Vermont. The owner, Steve Tatro, has twenty-five years of concrete experience and twelve years of operating his own business. Our mission is to exceed our customer’s expectations of satisfaction with our services. These specialties include commercial site concrete, stamped concrete, precast custom concrete, concrete countertops, railings, and concrete maintenance. With these services, we hope to leave a lasting impression. We are licensed and insured in Vermont, Massachusetts and New York.